We took on a new project, an old, small village house in Fitou. This time it is for a young couple who would like to make a living here or rent it out, we’ll see when it is ready. 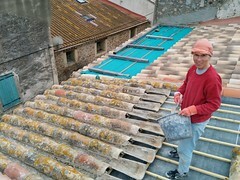 It’s the fourth house we are going to restore in Fitou and by now it is the one in a comparatively good condition. Together with the owners we made a plan how to transform it. Currently, it has an entry area, where was a kitchen and a bathroom, it had two rooms in the upper floor (not anymore) and an attic. We’ll divide and change the entry area to have space for a garage and a utility room and a bathroom. The first level will house a kitchen and a living room and in the attic we build two rooms and a small bathroom. We already started a month ago by emptying it completely. That means, we torn off some walls, plaster from walls and beams and removed all the usual rubbish from the attic and carried all the staff (3.000 kg!) to the decheterie.